I wanted to include more of the tenders in this pic, but I accidentally ate a bunch of them. 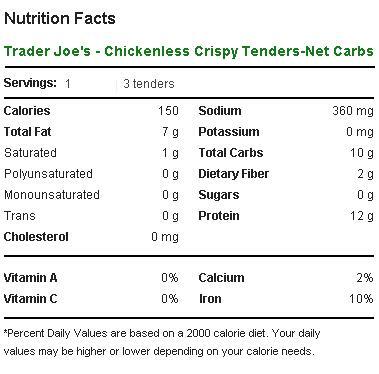 I’ve got to hand it to Trader Joe’s Chickenless Crispy Tenders – they’re some of the best fake meat I’ve had to date. I’ve commented before on the common pitfalls of vegetarian cuisine attempting to ape meat instead of just doing its own thing. Usually this ends in a painfully tortured product name that attempts to acknowledge that it’s totally vegetarian but tastes just like meat, wink wink. (cf. Tofurkey). Generally this is an outrageous lie, or, more generously, extremely wishful thinking by a meat-starved demographic. I’ve already expounded on my metaphysical sympathy for vegetarians. I can support the cause – I advocate the idea of abstaining from meat, and would do so myself if only my intensely bon vivant lifestyle would allow for it. Nevertheless, like the soy creamy ice cream substitute before it, I bought some crispy chickenless teneder because I needed a non-meat alternative for my (one) vegan friend. As fate would have it, I accidentally forgot to cook them in time for the meal, she ended up having nothing, and I was left with these chickenless tenders until tonight, when continued poor planning left me with nothing else in the house to eat. Fortunately, Trader Joe’s Chickenless Tenders are not just edible, but downright tasty. They actually taste more or less like chicken tenders. How close? Close enough you could probably fool an unwary guest if you served them up without fanfare. There is still that tell-tale aftertaste of “soy-ness” that hangs around, but it’s pretty mild and is more or less totally cloaked by whatever dipping sauces or dressings you’re going to be ingesting the chicken tenders with. The only strange part is that the strips have been “breaded” in a variety of oats and flours that result in a crumbly, quasi breading that’s generally inferior to ordinary breading. The reason for this substitution, I cannot quite fathom. 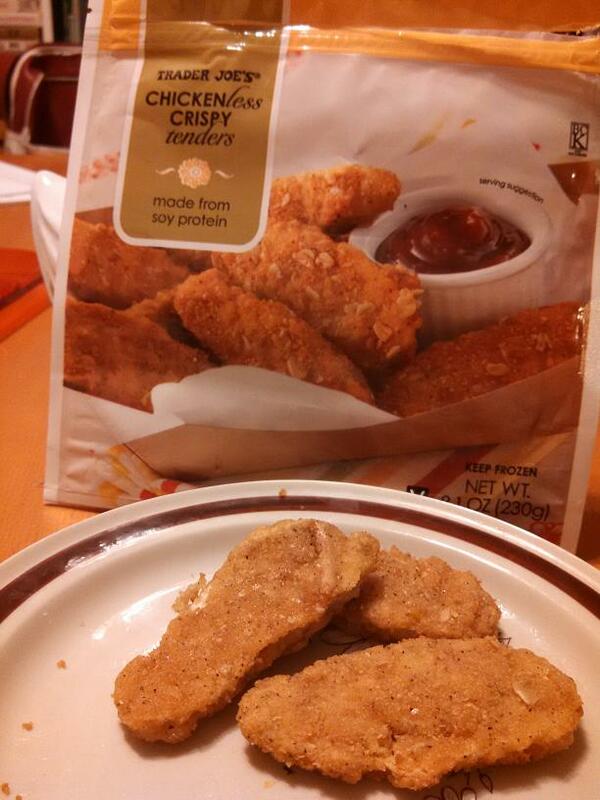 TJ’s has managed to capture not just the taste, but also the texture of breaded chicken strips. The tenders are precisely that, coming out of the oven tender, moist, and just toothsome enough to give you a nice balance between chewy and yielding. They even pull apart more or less like real chicken, which is a difficult feat to accomplish when your medium is soy protein isolate. How did TJ’s manage such a thing? I have no idea, but apparently it involves a large number of strange sounding, if allegedly natural, ingredients. 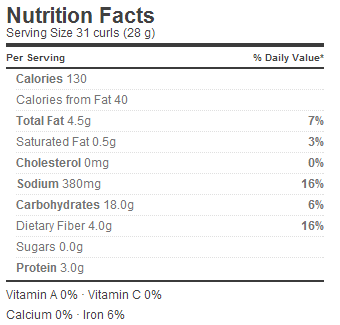 Water, soy protein isolate, and canola oil make up the first three ingredients, naturally enough. It might seem unusual that oil is ingredient #3, but remember that these are oven-baked “chicken” fingers we’re talking about. Like fish and or shrimp nuggets, when you take them out of the oven you’re going to be picking them up out of a little pool of their own oil. After these three ingredients things get a little crazy. Pea protein pops up in a prominent position. Are peas known for their protein? Is it possible to tell someone, out loud, that your food has a lot of pea protein in it and not make it sound like an unspeakable form of bio-waste recycling? Not as far as I’m concerned. After that we get into the ancient grain flours – including quinoa (natch), millet, and everyone’s favorite, amaranth. Rounding all that out is a good helping of Kamut®. “What the hell is Kamut®, and why is it trademarked?” is the very reasonable question you might be asking yourself right now. We’ll have to save that can of worms for another day, but the short answer is it’s a proprietary form of ancient wheat known as Khorasan wheat, originally from round about Afghanistan and nowadays lorded over by two Montana farmers. 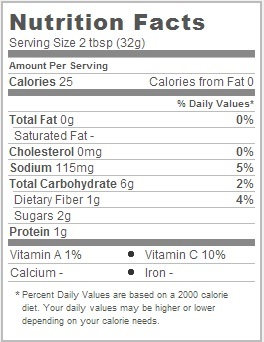 Also there’s beet root fiber in the tenders. Somehow, in the end, all of this comes together to make strangely delicious vegan chicken tenders, with only thrice the fat of regular chicken tenders. For me it’s less important how it all works out, then the fact that it does. They might not replace regular, flesh and blood chicken in my life, but it’s good to know there’s a good back up option should it ever come to it. Would I Recommend It: I would, if you’re a vegan/vegetarian. Would I Buy It Again: This seems like a good fit for Meatless Monday. Final Synopsis: Eerily good vegan chicken tenders. Once again, we must wonder why this isn’t from Trader Jupti. As promised we continue Frozen Indian Food week with Trader Joe’s Channa Masala. Sure, the name might not be as hypnotically rhythmic and soothing as Aloo Chaat Kati Pouch, but this spicy, tasty, cheap and tangy chickpea dish has just as much to offer on the flavor front. As you might guess from the above description, this dry and tangy dish comes from the dry and tangy regions of Northern India. Rajistan in the north west of Indian, and the neighboring regions, are dominated by the great Indian Thar Desert and something of the sere nature of this region has permeated the food that comes from here. The Thar Desert (bordered to the south by the Great Rann of Kutch) is, of course, famous for having the best desert name of all time, just above Gobi and Mojave. The Thar Desert’s other claims to fame, of course, is as the setting for Rama’s attack on Lanka with his army of vanaras, when he and had to use his agneyashtra-amogha to dry up the drumakulya, leading to the creation of the Marukantara, but that may just be my opinion. At any rate, masala, as we maybe all probably know, is the general South East Asian term for a mixture of spices, while channa, or chana, is the Hindustani word for chickpeas. That, and exactly that, is what you get in Trader Joe’s Channa Masala – a bunch of garbanzo beaans mixed into a sauce of onions, tomatoes, peppers and some usual Indian spices (namely, cumin, fenugreek, tamarind, mango powder and cilantro). What that means is, you get a damn good side dish with a bunch of different flavors going on. The garbanzo beans cook up in a couple minutes in the microwave, and come out with just the right texture – a nice toothsome bite that is neither too hard nor too mushy. The sauce starts out with a savory, slightly charbroiled taste that gives way to a nice low burn as you eat. Where things start to get a little weird is around the edges of these flavors, where a noticeble, delicate sourness comes in. This hint of sour is the result of the mango powder and tamarind spices, and turns the whole meal into something more considerable than a simple bean side dish. 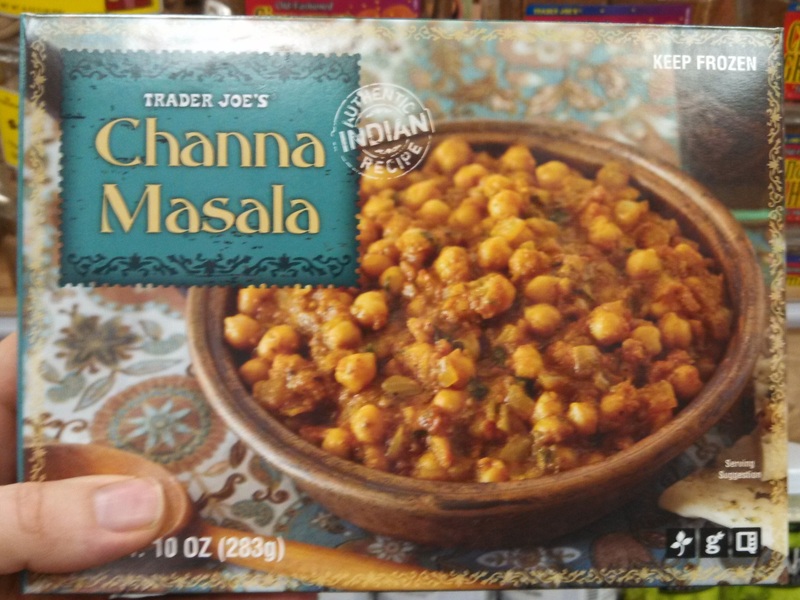 Trader Joe’s claims they make their Channa Masala from a traditional Indian recipe, and while that’s the sort of claim I usually write off immediately as marketer-speak, it really seems to be the truth in this case. This is a solid, and simple dish perfect for pairing with a more substantial entree – the Aloo Chaat, for example, would give you a complete, rather good Indian dinner in about 6 microwaveable minutes. Would I Recommend It: Yes, these are some tasty beans. Would I Buy It Again: Yes, this is an excellent solution for my go-go lifestyle. Final Synopsis: A cheap and easy Indian chickpea dish. Nothing says snack food like lentils! The first thing I’ll say is, I really wish they had made these into chips instead of crunchy spiral snack tubes, because there is no easy way to say “crunchy, spiral snack tube” in the English language. Let’s agree to call them “curlicues” right up front and get on with things. 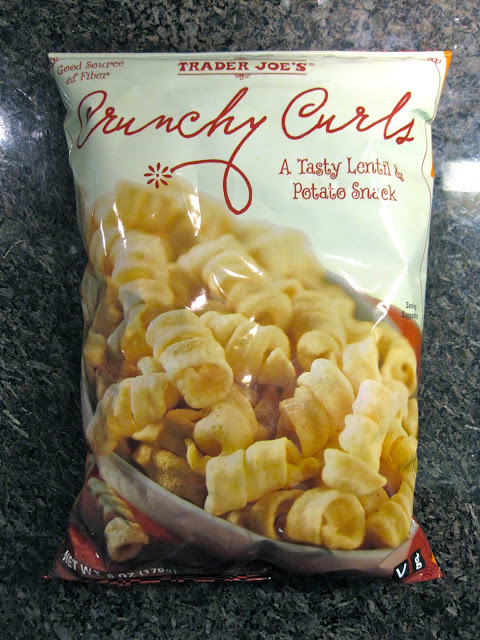 So, TJ’s, why make a lentil and potato curlicue snack? Are there not plenty of crunchy snack options around? Is America not the land where you can walk down a 60′ long, triple-tiered aisle of snack chips every time you go to the supermarket? The land of the mighty Dorito, undulating Ruffle and tubular Pringle? Do you really think a bland looking, lentil and potato based thing that just happens to be a spiral is going to be able to stand it’s ground in the face of Cheetos, Funyuns, Bugles, Fritos, et al.? 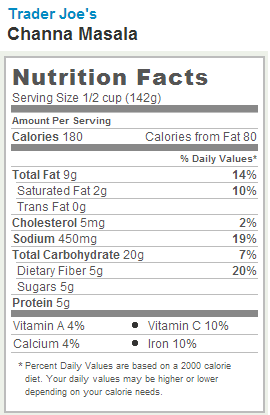 Before we condemn these lentil-based curlicues with a thunderous cry of “Unnecessary!”, let’s look a bit closer. Notice, if you will, that Trader Joe’s Crunchy Curls are both gluten free and vegan. It goes without saying that gluten free, vegan snack foods are few and far between in this world. Try a Google search for the term and have fun choosing from all three options you get. I have vegan friends, I feel for their plight. I know it must be hard to maintain your resolute moral bearing while guys like me stroll around stuffing their mouths with tender beast flesh, sauteed mushrooms, moist, flaky croissants, etc. A gluten-free, vegan snack crunchy, salty snack just answered a lot of people’s prayers. The big question, of course, is if it’s actually worth buying. Unfortunately, these curlicues left me flat. The taste isn’t the problem – they’re salty enough to scratch that salty food craving but not so salty that you’re rushing for your glass of water. The lentil/potato flavor is palatable if uninteresting with that long, starchy aftertaste – basically similar to munching down on a few Lays at once. The thing that disappointed me was how hard and crunchy the curlicues were. I know “crunchy” is right there in the title, but this snack combines “crunchy” with “hard”. Because of the thickness of each curly cue, each bite is like a fresh assault on a fortified compound. You don’t have to worry about mindlessly munching these down – pop a handful in your mouth and you’ll be busy for a minute or so. In the end, however, that’s quibbling. If you’re in the market for vegan / gluten-free chips, these are basically fine. You won’t hate them, and they’ll hold up in your hummus dip. If you’re under no such strictures, however, there isn’t much reason to prefer these over anything else in the aisle. Would I Recommend Them: Only if you’re on a vegan / gluten-free diet. Would I Buy Them Again: Barring a major lifestyle change, no. Final Synopsis: A good snack food – for being vegan and gluten-free. 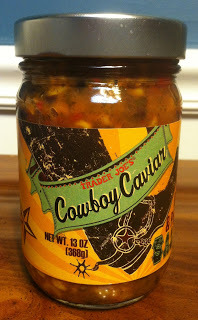 Trader Joe’s Cowboy Caviar Salsa is, hands down, the grossest product name in the store. I’m no marketing expert, but if you want to sell someone your strange, globular salsa you might be thanked not to name it after fish eggs pulled from the ugliest fish in the Caspian. That aside, this corn-filled, black bean-based salsa is a bold, tasty alternative to your standard yellow-cap Pace and worth a look for anyone. Do not confuse with Rocky Mountain oysters. I should say that the blame for the name is not strictly TJ’s fault in this case. Cowboy caviar was first crafted into existence in the 1950’s by Helen Corbitt, famed chef, fresh food advocate, innovator of bold new cuisine and, ultimately, head chef at the flagship Neiman Marcus in Dallas, Texas – famed at the time (and known still) for its fine eating. The South, as every good southerner knows, has a hankering for black-eyed peas – a hankering that includes, but is not limited to, mandatory black-eyed pea consumption on New Years Day. Thus the decree that Neiman Marcus was to roll out an “all-Texas” menu, prominently featuring the beans was no surprise. No, the surprise was that Helen Corbitt, herself a Yankee girl from New York, detested black-eyed peas, and couldn’t bring herself to serve them in a traditional way. Instead, she pickled them in onions and served them as a chill dip – and lo history was made. Trader Joe’s differs from its primogeniture by introducing the aforementioned corn, plus onions, red bell pepper and , perhaps hereticaly, swapping black beans for black-eyed peas. The chunky veggies are mortared by a mix of chipotle peppers, adobe sauce and lime juice – and the result is a dang good, medium salsa that give you plenty to chew on chip by chip. In addition to the touch of fire, you’ll pick up a citrus tang and even a hint of sweetness, which makes this an interesting salsa all around. I myself am a die hard salsa fan, willing to take it any way I can get it, and to me this is one astounding find. Even with the sudden coming into vogue of non-traditional salsas (mango & papaya salsa, for example) there’s still a paucity of tomato-free varieties. Why not get the tomatoes the hell out of there? It’s the 3rd millennium A.D. isn’t it? “Nothing is sacred” is all but the mantra of our epoch – I don’t see why we should stop at tomatoes as salsa. If you’ve ever been to a Trader Joe’s you know that they have a host of intriguing chips to go along with this salsas and dips. Why not try a bag of Super Seeded Tortilla chips when you pick up your southwester, rough-ridden, saddle-packed jar of cowboy caviar. Would I Recommend It: Surely I do. Would I Buy it Again: It’s a good change of pace salsa, if not an everyday kind of salsa. Final Synopsis: Pickled corn and beans? As a salsa? Yessir, and damn good one. 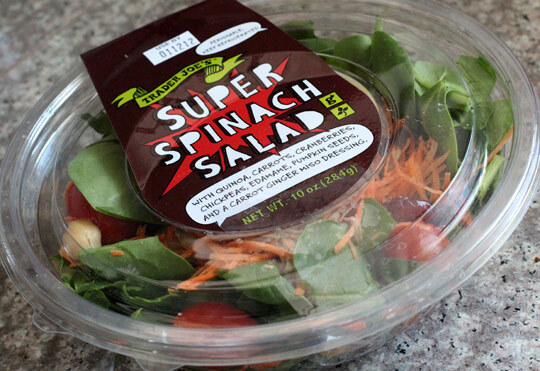 An interesting salad, this Trader Joe’s Super Spinach Salad, an intriguing salad, but not necessarily a very good salad. Spinach is an incredible base for any salad – tender, and flavorful, and supple, and yielding to the ardent bite, and nutritious, and, and, and – well, I could go on. I have a deep and abiding love for leafy, raw spinach that manifests itself in a refrigerator stuffed full of salad greens and dirty looks I throw at petulant children. My adoration of spinach, I’ll admit, is partially irrational. You see, I lost my salad virginity to spinach. I was a young man, a college freshman. I hadn’t been looking for love, I didn’t even think I was interested in salads. I had grown up around plates of iceberg lettuce and, apart from the occasional juicy crouton or Baco Bit, they did nothing for me. But then I saw it, there in the dorm cafeteria’s buffet , demure but intriguing. I remember stuffing my mouth full of the delicious young sprigs, the juicy blast of nutritious flavor. I can taste it still. That day changed my life, leading me into the wonderful world of salads, and though I’ve often played around with exotic radicchios and roquettes I’ve always returned home to those tender, loving fronds. So you’d think a TJ’s spinach salad would be an almost perversely easy slam dunk, right? Not so. Trader Joe’s Super Spinach Salad offers up the sort of charmingly eclectic list of ingredients see in some of their other excellent salads, quinoa, carrots, cranberries, chickpeas, edamame, tiny little tomatoes, and pumpkin seeds, but they simply do not work as well as a unit. It’s hard to say where the salad goes wrong. The main problem seems to be the carrot ginger miso dressing, which is, one, a strange combination of ingredients that don’t work very well with the salad mix, and two, unusually thick, almost like a very gritty mayonnaise that resists spreading evenly across the salad. Worse, the dressing leaves a strong aftertaste of onion in your mouth that lingers on long after the salad is finished. The veggies do make for a crunchy, crispy unit that’s not bad for munching on, and I would suspect that if you ditched the dressing and substituted it for a personal favorite the salad would benefit greatly by it. Even worse than being unpalatable, the dressing commits the all-too-common sin of wrecking the otherwise very healthy nutritional profile of the salad. Check out these post dressing stats: 19g of fat (a third of your daily intake), and a whopping 53g of carbs which, even controlling for the 10g that come from fiber, is more than a Big Mac packs. I’ve got nothing against the occasional decadent salad (perhaps choked with gorgonzola and candied pecans), but it has to be pretty fantastic tasting to make the calories worth it. This salad fails to deliver anything like the level of enjoyment I’d demand for blowing my diet for the day. Would I Recommend It: With a caution – lose the salad dressing and substitute a healthy alternative. Would I Buy It Again: Not I, there are far more interesting salads to explore. Final Synopsis: A very promising salad ruined by a very poor salad dressing. Both title, and total list of all ingredients. Whoa. What a name! 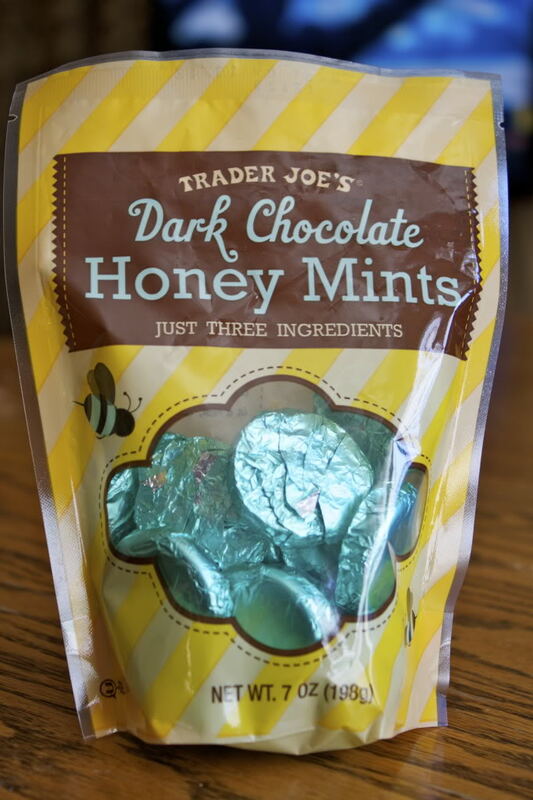 Trader Joe’s Dark Chocolate Honey Mints, this little confection could not be cheekier – 3 ingredients, all listed there in the name, thrown together in a fit of what could only have been hubris. Dark chocolate, honey and peppermint extract. This is an almost frighteningly bold undertaking – even the most cursory glance at the ingredient list reveals that TJ’s is not f-ing around here. There are seriously only three ingredients – honey, chocolate liquor and oil of peppermint. Is it even okay to do this? Or, better question, is it reasonable to do this? When you’re squaring yourself up against York Peppermint Patties, beloved classic and mainstay of parlor candy dishes the nation over, do you really want to start self imposing handicaps like “oh, and we can only use three ingredients.” It is absolutely a move on which Trader Joe’s should be applauded, in the same way you should applaud someone who just ran ten consecutive marathons or ate a box of light bulbs, after a brief pause and with a quizzical look on the face. The fact of the matter is that these patties are not particularly helped out by this three ingredient policy. They taste simply alright, like a slightly stronger and aggressive York patty with a sweeter aftertaste. The texture, size and minty bang are nearly identical – the clash of flavors is what marks it as different. The honey whipped filling doesn’t exactly gel with the mint flavor and the dark chocolate shell. As we’ve previous discussed, dark chocolate, while perfectly good on its own, simply cannot be treated like milk chocolate. These are not mere adjectives people, dark and milk chocolate are different beasts all together – milk chocolate the friendly pony who nuzzles your hand as he prances, dark chocolate the powerful, curried stallion, illuminated for a moment on a rocky crag by a flash of lightning. While it complements the mint oil, the honey wants to be sweeter than the unsweetened dark chocolate will allow. Would this taste issue be ameliorated if TJ’s had allowed the addition of byzantine bisorbates and other curious additives? Perhaps not, but as it stands the candy doesn’t work well enough for me to spend my calorie budget on them. Afterall, even though it lacks the preservatives, artificial colors, and high fructose corn syrups it’s still 17 grams of sugar and 6 grams of fat per serving – a worse nutritional profile than York Peppermint Patties. To adherents of certain nutritional philosophies I’m sure the absence of manufactured additives constitutes an enormous draw, to me however this comfort is purely hypothetical. I listen to my brutal, masticating jaw and swollen gullet, and they advise me that despite the intriguing lead-in there is little to recommend this product. Would I Recommend It: No, save for those with grudges against the York corporation or an adversion to America’s typical food chemicals. Would I Buy It Again: Sadly, no. Final Synopsis: A York Peppermint Patty, but with a greater clash between bitter and sweet. Holy of holy’s folks, it’s a two for one review today. I, like many Trader Joe’s regulars, have passed up the bracketfuls of dried fruit bars at the checkout lines on countless occasions. Finally, not unlike with their chocolate nibs, the persistence of their offering has succeeded in wearing down my defense, leading me to pick up both the Trader Joe’s Boysenberry Fruit Bar and the Trader Joe’s Apple and Raspberry Fruit Wrap. Fruit wraps that, enigmatically, are not wrapped around anything at all. Are these strips of pounded fruit good enough to quality as an impulse purchase? Are they secret delicious treasures, or uninspired after thoughts. More importantly, how do they match up against each other? To answer all these questions and more I unwrapped and bit in. Mash up some fruit with some pectin, and sugar, leave to dry. 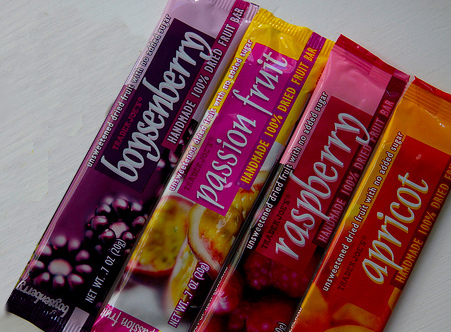 That’s about all there is to a fruit bar/ wrap – so why are there two different, competing brands? And why market one a as a bar and one as a wrap? Which is superior? Are we seeing a rehash of the classic Fruit Roll-Up / Fruit Leather rivalry in the TJ microcosm? Is this the manifestation of rival department heads battling it out to lay claim to the under-a-dollar-fruit-based-strip-snack-impulse-buy crown? For the purposes of this post I’m certainly going to assume so. In charge of the Fruit Bar Division (Boysenberry, Apricot, Raspberry, Strawberry, Passionfruit) we have Jerry O’Conal, 42 trim, and coincidentally homophonic twin of actor Jerry O’Connell. In charge of the Fruit Wrap Division (Apple-Raspberry, Apple-Banana, Apple-Blueberry, Apple-Strawberry) is Igmar Eisenlumb or “Iron Tusk”, a German immigrant, also 42 and trim. Jerry’s Irish-Catholic upbringing and growing up in the shadow of his over-achieving older brother, has generated a deep, almost neurological compulsion to succeed in his every endeavor Conventional wisdom holds that Jerry cannot be stopped. Igmar immigrated to Boston at a young age, where he picked up a Southie accent he has never totally shaken. His unusual past and a tendency to ruthlessly apply logic to every situation has rendered him a perpetual outsider – albeit one with an exceptional track record in the fruit wrap field. Obviously the scene is set for an incendiary confrontation. Let’s see how Jerry and Igmar’s combatants stack up, shall we? Entirely made of fruit from British Columbia? Breaks the iron law of arithmetic? Is it actually a wrap? As you can see, the outcome is far from decisive. 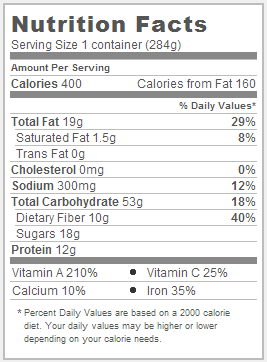 The fruit bars are slightly more filling, with more fiber packed into the same number of calories, and more exotic varieties to choose from. 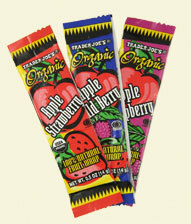 On the other hand, the fruit wraps are certified organic, but harder to handle. The important takeaway from this is that both Jerry and Igmar should take a step back and see that their differences are minuscule and that both products are essentially identical. Are they both good to eat? Absolutely, they both taste like delicious, preservative free, all natural, fruit leather. If you need a fruit bar from Trader Joe’s either of these will do you just fine. If forced at gun point I’d go with the fruit bar over the fruit wrap because, in the end, I like my fingers to be clean. Would I Recommend It: I’d recommend either of these to anyone interested in revisiting their childhood lunch bag or fixing their kid’s sweet tooth. Would I Buy Them Again: I might pickup a few Fruit Bars for a car trip or hike. Final Synopsis: Fruit leather, by any other name, tastes just the same.